Bus from Penang to Kota Bharu is one of the tourist bus routes in Malaysia connecting Penang and Kota Bharu, which is the gateway to Perhentian Island. After spending their holiday in Penang attractions like Kek Lok Si Temple, wall painting by Lithuanian artist Ernest Zacharevic, Unesco World Heritage Site The Streets of Georgetown, etc, some of the tourists proceed to Perhentian Island to enjoy white sand island surrounded by crystal clear water. Bus from Penang to Kota Bharu is the most convenient option. Arriving at Kota Bharu Bus Terminal by bus from Penang, there are taxi and minivan services to transfer customers to Kuala Besut jetty. The taxi fare to Kuala Besut jetty is at around RM80/taxi/way. By minivan, the cost is at around RM35/person/way. A boat from Kuala Besut jetty to Perhentian Island takes about 30 minutes journey by a fast boat. Fast boat from Kuala Besut to Perhentian Island is usually available throughout 9:00 a.m. to 5:00 p.m. And in fact, Kuala Besut jetty does not have regular ferry schedules for departures. They head towards the island so long as there are enough passengers. The bus fare for bus from Penang to Kota Bharu is at about RM 41.20 – RM 41.50, provided by Transnasional and Perdana Express. Transnasional is the largest and most reputable bus operator in Malaysia while Perdana Express is the recent well-managed emerging player. Their coaches run daily at 9 a.m. and 9 p.m. from Penang to Kota Bharu. The duration for bus from Penang to Kota Bharu usually takes about 7 hours, depending on traffic conditions. 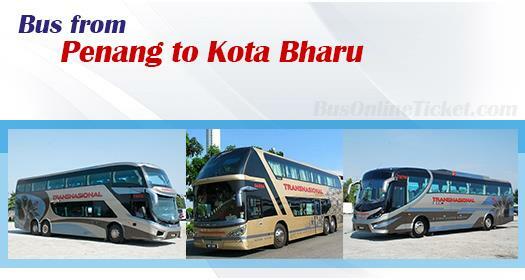 So by taking the night bus at 9 p.m., passengers should expect to arrive at 4 a.m. at Kota Bharu Bus Terminal. Then the transfer by taxi or minivan to Kuala Besut takes about 1 hour. Travellers will be just in time to catch the first morning ferry to Perhentian Island. Coaches provide direct service from Penang to Kota Bharu with 1 washroom break provided along the journey. Please note that all coaches depart from Penang Sungai Nibong Bus Terminal. Taking bus from Penang to Kota Bharu is convenient, economical and comfortable. Now it is even more hassle-free by booking Penang to Kota Bharu bus ticket online at BusOnlineTicket.com with instant confirmation. Due to the limited daily bus schedules, book your Penang to Kota Bharu ticket online in advance to avoid disappointment for your trip from Penang to beautiful Perhentian Island.